First published Feb. 1, 2006, on the “Resin the Barbarian” blog at GJSentinel.com. Growing up, the classic movie monsters were right up there with superheroes as my favorite things. I spent hours reading comics and magazines such as Famous Monsters, and I loved building model kits of my favorite characters. I rediscovered the plastic-model hobby about four years ago, and shortly after that I found out about garage kits. Ever heard of them? Basically put, they’re model kits made of resin or vinyl, usually in very limited runs and often produced by people who simply enjoy the subject matter. The producers seldom make much money doing it, even though people like me barely think twice about overheating our credit cards when we find something new we like and know we really might miss out on if we don’t act soon. 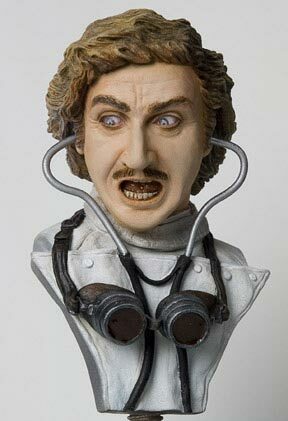 What you see above is the Young Frankenstein (Gene Wilder) Bust offered by the wonderful garage-kit companyForbidden Zone. It’s made of resin, 1/4 scale, sculpted by Howard Senft of Denver, and sells for $55 plus $6 U.S. shipping. The one in the picture above was painted by Steve Parke. The kit (unbuilt and unpainted) is available now but hasn’t made it to Forbidden Zone’s “merchandise” page. Check out “coming soon” to see more pictures and, if you’re interested, find out how to get in touch with Forbidden Zone by clicking on the “contact us” link. My wife, Lisa, gave me two Forbidden Zone kits for Christmas: a Frankenstein Monster bust and Frankenstein Meets the Wolf Man kit. They reached my home in great shape and the castings – by Earthbound Studios’ Mark Brokaw, who has a well-earned reputation as the best at what he does – were nearly flawless. Some garage kits can come with a lot of air bubble holes and flash in the resin that have to be cleaned up, but not these. Seeing them convinced me to go ahead and grab the recently introduced Young Frankenstein bust and it’s every bit I hoped for. Me: What got you interested in producing garage kits? Mike: Well, I guess my story is similar to a lot of folks in the hobby. I have always been a huge film fan…and specifically a classic horror film and sci-fi fan. When I was a kid, my father turned me on to the Universal classics. My favorite has always been the original Frankenstein…1931. As a kid, I had to have all of the Aurora Monster kits. In the early 90’s I discovered garage kits and I was instantly transported back to my childhood and the joy I had while building those Aurora kits. While I found some great kits being produced by other people, there were some kits that I wanted to own that weren’t being produced. A good friend of mine was producing great kits, so with his company as an inspiration, I decided to take a stab at it. I only intended to do one or two things…but it kinda snowballed out of control. Suddenly I was a full-fledged garage kit company. Me: Is producing garage-kits a money-making proposition, or a money-losing one? I think most people get into it for the love of the characters…the films…the subject matter. I started off as a collectors…and I guess I still consider myself as such. Me: Have you met any interesting people as a result of producing garage kits? If so, who? Mike: I will say that, for the most part, everyone I have met in this hobby have been good folks…friendly and down to earth. There are so many talented artists involved in all of this! I consider myself an artist and I am always inspired by the work I see from the folks in the garage kit world. Many people may look at all of this and see plastic monsters…but I see fine art. Talented sculptors, painters and fabricators abound in this genre! I think to simply call it a hobby isn’t giving it enough credit! As far as “famous” people, I have met great film industry folks that wouldn’t have normally had access to. Mostly great special effects artists like Ray Harryhausen, Greg Nicotero, The Skotak Brothers and Steve Wang. I have also met great monster fan/collectors like Bob Burns and Forrest J. Ackerman as well as Sarah Karloff and Bela Lugosi Jr. Sarah and Bela Jr. were a treat…since their fathers starred in my beloved classic horror films. I have also met actors like Daniel Roebuck, Jeff Yagher (also a great sculptor who has done work for me) and other actors and actresses form classic sci-fi and horror movies. The one person that has eluded me over the years is Rick Baker! This article was posted in 2006 archive, Monsters, Producers, Resin and tagged Forbidden Zone. Bookmark the permalink. Follow comments with the RSS feed for this post. Both comments and trackbacks are closed.